Dr. Maria Soltero-Rivera received her DVM from Cornell University in Ithaca, NY. After that, she returned to her native Puerto Rico for a year-long small animal surgical internship at Veterinary Specialty Hospital in San Juan, followed by a small animal rotating internship at Long Island Veterinary Specialists. Dr. Soltero-Rivera completed her residency in Dentistry and Oral Surgery at the University of Pennsylvania where she remained working as a lecturer for the following two years. She became board certified in Dentistry and Oral Surgery in 2014. 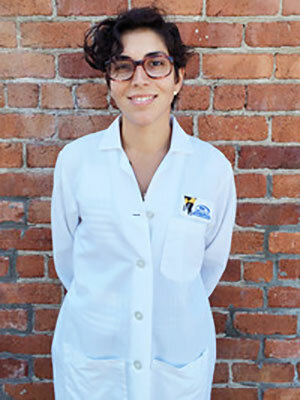 More recently, Dr. Soltero-Rivera and her family moved to the Bay Area where she works in a private practice, VCA-San Francisco Veterinary Specialists, but she remains affiliated with her beloved PennVet as an Adjunct Assistant Professor. Her clinical interests include diagnosis and treatment of oral tumors, chronic inflammatory oral disease, and oral and maxillofacial trauma repair. During the weekend, Dr. Soltero-Rivera enjoys going park-hopping with her almost 3 year old daughter and husband, taking her two Chihuahuas (Olivia and Pickles) out for a stroll on the beach, reading a book (occasionally able to do so) and dancing while doing chores. Tooth fractures are a common cause of oral discomfort in dogs and cats. These can have a prevalence of up to 27% in healthy animals and up to approximately 72% in animals that have undergone maxillofacial trauma. In our experience, up to 20% of patients are repeat offenders. In these patients more than one fracture may be found during an oral examination or they may present more than once for this problem. Fractures can lead to indirect or direct pulp exposure, causing irreversible pulpitis which is why these should not be ignored. Necrosis of the pulp will increase the risk of developing infections and this can lead to periapical disease. When functionally important teeth are affected or in working pets, there are several endodontic therapies that can be considered in order to salvage these teeth. Evaluation of the status of the peridontium of affected teeth is also recommended. If these are not viable options for your patient or in cases in which endodontic therapies fail, extraction can also be considered. After treatment, reinforcing these teeth is recommended for working pets. Whenever possible, behavior modification as well as modifying the toys and treats offered is also recommend in order to prevent recurrence. This lecture will discuss different presentations of tooth fractures and options for treatment with the intent of salvaging these and preventing future re-fractures.